Okay...confession time: I'm a Gleek. They had me from the beginning of the show when they sang "Don't Stop Believin," and especially to last season's finale when they had a Journey medley at the regional competition. 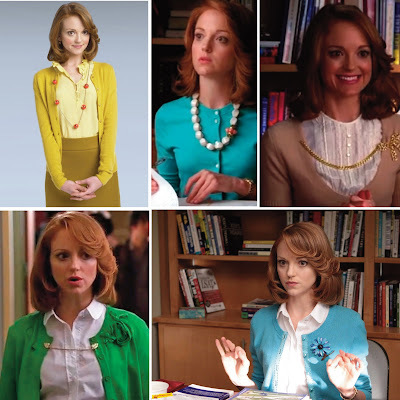 Another thing that keeps me coming back is to see what the counselor, Ms. Emma Pilsbury, is going to wear next! In an interview with Zap 2 It, the show's stylist, Lou Eyrich, said Emma's wardrobe is a mix of vintage and contemporary pieces, with a lot of her wardrobe coming from Target. "She's prim and proper, but she's not afraid to mix her colors," Eyrich said. And that is the main reason I love Emma's style; she's a primary color-lover's dream! Her outfits are always bright and bold, decked out with bows, cardigans (and sweater clips!) and pearls, with that perfectly curled semi-70s hairstyle. When you bring it all together, it's so charmingly eccentric. I'm kind of bummed at the selection of photos online...none of them showed some of my favorite outfits she's worn (especially the really large bow-scarves), but I guess you'll just have to watch Glee to see for yourself! Other than Target, Eyrich says they also shop around at stores very accessible to the masses: J. Crew, H&M, Urban Outfitters and Zara, to name a few. And all of these brands make regular appearances at second-hand stores (lucky us!)! Now get out there this weekend and see what you can thrift!